You are currently browsing the Jeremy Banning blog archives for the year 2010. 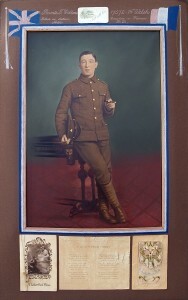 As a slight aside from the work on the Tunnellers Memorial I am glad to report that I have managed to secure a permanent home for a treasured portrait picture of a young man who lost his life in the Great War. When I tracked down John Abraham in March 2010 and we met to discuss Thomas Collins and the Tunnellers Memorial he showed me an amazing picture of Thomas which had always hung in the Collins family parlour. Details of this are given on this blog entry. The full length picture was accompanied by his death scroll, both framed but in need of restoration. Following a conversation with John Abraham who suggested the picture needed lodging in a suitable military museum I am delighted to say that the Royal Engineers Museum at Chatham has agreed to take Thomas’ picture and death scroll to hang alongside William Hackett’s picture. Their stories are inexorably intertwined and I am not alone in feeling that there is a potent symbolism in their pictures hanging alongside each other while they both lie entombed 40 feet below the fields of Givenchy. However, that is not the end of the story. Thomas was the eldest boy of the family. His younger brother was Daniel who, like Thomas, served his country in its hour of need. Sadly, Able Seaman Daniel Collins, RNVR was killed on 26 February 1918 on “SS Greavesash”, a merchant steamer which was torpedoed without warning by German submarine UB-74 and sunk off the Normandy coast. Daniel was one of eight crew who were killed that day. On our visit to Swansea John Abraham also presented us with a framed portrait of Daniel along with his death scroll and asked that we secure a home for it too. This presented me with a problem as I knew the RE would be keen on Thomas’ picture because he was so integral to one of the best known VC actions in the war but I had no idea who to approach for safeguarding Daniel’s picture. I have tried the Royal Naval Museum at Portsmouth but sadly, they are unable to take this as it needs some restoration work and their space for storage is limited. I guess it will now have to go back to the family – it would have been nice to have had both brother’s pictures in museums. Son of Jack and Rachel Collins, of 58, Colbourne Terrace, Swansea. His brother Thomas also fell. Son of Jack and Rachel Collins, of 58, Colbourne Terrace, Swansea. His brother Daniel also fell. 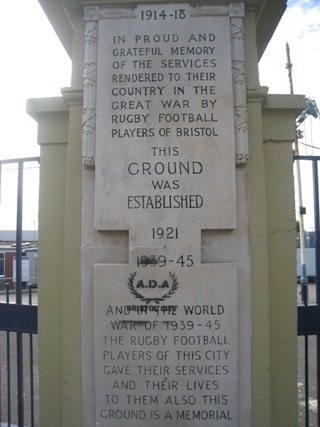 The Memorial Stadium was built to honour the memory of the rugby union players of Bristol who were killed during the Great War and is now the shared home of Bristol Rugby and Bristol Rovers FC. I was most saddened to see this. As a season ticket holder for the rugby club I always figuratively doff my cap when passing the gates. Mindless stupidity as ever in cases such as these. More details are available on the Bristol Rovers website. The Bristol Evening Post says that the vandals returned last night and plastered the South Stand with graffiti – even painting the nearby toilets and pasty stand. The mind boggles at the pathetic childishness of some people. This is a good example of how proper education on the sacrifices made in the Great War is still so important. Whilst up in London earlier this week attending the private view of the Armed Forces Art Society exhibition at the Mall Galleries I took the opportunity to have a quick look around Horse Guards Parade. Having moved from London in 2003 it had been some time since I had been in that part of the capital. The most recent visit to the area was in January 2009 to hear the most uninspiring Franky Bostyn lecture on tunnelling in the Great War at the Guards Chapel on Birdcage Walk. This was organised by the Guild of Battlefield Guides and the chapel had the usual feeling of an officers mess. I well recall the most exciting aspect of the evening being when the acknowledged underground expert Johan Vandewalle (who had come over from Belgium) challenged Bostyn on his use of Johan’s written and visual material for his lecture without first obtaining Johan’s permission. That ruckus certainly woke up some of the old boys. Surely the highlight of a most dreary hour and a half?! 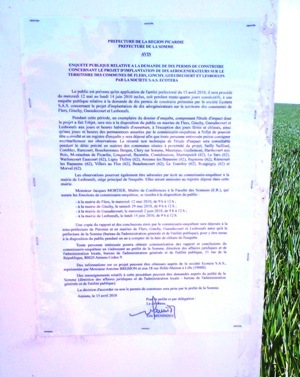 Johan’s letter to the Belgian Ambassador can be read here. Sadly he never received a response from the Ambasador or the Guild. So, as I recalled this event I strolled over to Horse Guards Parade, killing time before I went to the exhibition. I walked past the National Police Memorial which I recall reading about when it was unveiled. 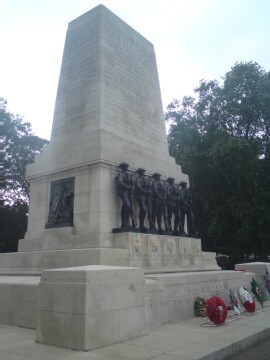 Next, set on the very edge of St James’s Park is the wonderfully aesthetic Guards Memorial. Having travelled regularly to the battlefields over the past few years with an ex-Scots Guardsman I have been immersed in many deeds of that fine bunch of men. 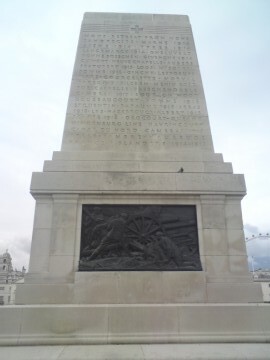 This highly impressive memorial is constructed from Portland stone and was unveiled on 16 October 1926 by the Duke of Connaught. It is dedicated to the five Foot Guards Regiments of the Great War – Grenadier, Scots, Welsh, Irish and Coldstream. There are five beautifully sculpted bronze figures denoting Guardsmen from the five regiments. To the Glory of God. And in the memory of the Officers, Non-Commissioned Officers and Guardsmen of His Majesty’s Regiments of Foot Guards who gave their lives for their King and Country during the Great War 1914-1918 and of the Officers, Non-Commissioned Officers, Men of the Household Cavalry, Royal Regiment of Artillery Corps, Royal Army Medical Corps and other Units while serving the Guard’s Division in France and Belgium 1915-1918, fell with them in the fight for the World’s Freedom. This Memorial also commemorates all those members of the Household Division who died in the Second World War and in the service of their country since 1918. The two sides of the memorial list the units in the Guards Division – each battalion on one side – but also the Divisional Troops including Artillery, RAMC and RE Field Companies (good to see 76 Field Company RE named – we used extracts from the diary an officer who served with that company, Lieutenant Harold Ridsdale, in the Passchendaele panorama volume) as well as 46th Mobile Veterinary Section of the RAVC (Royal Army Veterinary Corps). 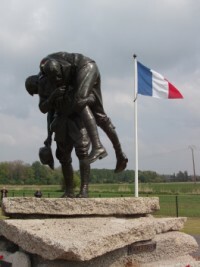 Mons, Retreat from Mons, Landrecies, Marne 1914, Aisne 1914, Ypres 1914, Langemarck 1914, Gheluvelt, Nonne Bosschen, Givenchy 1914, Cuinchy, Neuve Chapelle, Aubers, Festubert 1915, Loos, Mount Sorrel, Somme 1916, Ginchy, Lesboeufs, Flers-Courcelette, Morval, Ypres 1917, Pilckem, Menin Road, Poelcappelle, Passchendaele, Cambrai 1917, Bourlon Wood, Gouzeaucourt, Somme 1918, St Quentin, Bapaume 1918, Arras 1918, Lys, Hazebrouck, Albert 1918, Scarpe 1918, Drocourt-Queant, Hindenburg Line, Havrincourt, Canal Du Nord, Cambrai 1918, Selle, Sambre, Mauberge, France & Flanders 1914-1918. It really is a most impressive memorial and I would certainly suggest a visit if in the area. It is worth spending a few minutes remembering this fine body of men serve with such distinction on the Western Front throughout the war. Further details can be found at The Guards Museum which is a few minutes walk away on Birdcage Walk. 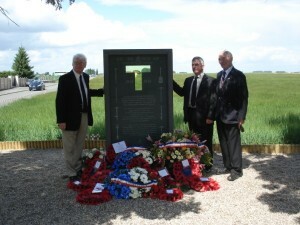 A quick report on the terrific day for the unveiling of the Tunnellers Memorial at Givenchy-Lez-La Bassée. Well, where to start?! Firsty, many thanks to all who attended including friends and family plus representatives from the Historial at Peronne, Durand Group and Brian Owen from the Royal Welsh Fusiliers Museum plus many tunneller’s relatives. The weather certainly did its best to dampen the day but everyone battled on until the sun finally came out. The Territorial band of the Royal Engineers played and marched for twenty minutes along the streets of Givenchy with locals and schoolchildren joining and following. They were then led by an honour guard from the Corps to the site selected for the speeches. Other attendees included Hackett Troop from the Royal School of Military Engineering as well as General David Bill (late RE) represented the British Army and the defence attaches of Canada and New Zealand. 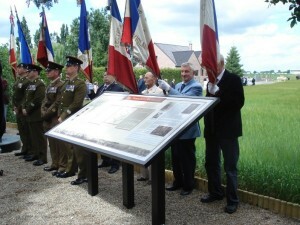 Veterans’ organisations from France paraded their standards along with those of the Ypres, Somme and Pas de Calais Branches of the Royal British Legion. 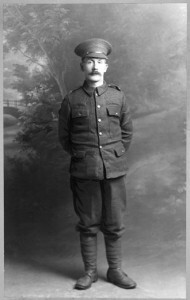 The great nephew of Sapper William Hackett attended along with three nephews of Thomas Collins – John Abraham, John Carroll and Terry Carroll. I was especially proud to see them there after my work in tracking them down. By the time we all formed up we estimated the total attendance to be 300 – 400 people. Speeches were made by Monsieur Jacques Herbaut, Maire de Givenchy (with translation into English provided by Mme. 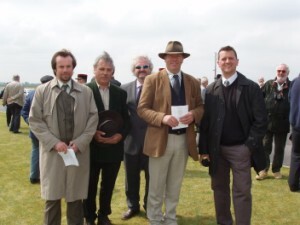 Tracy Bernard), General David Bill, Peter Barton and finally a reading of John French’s diary entries for the period by me. It was a very emotional moment reading these words with relatives of William Hackett and Thomas Collins standing just a few yards away. We then all moved down to the site of the Shaftsbury Shaft where Reverend Pat Aldred conducted a blessing for Sapper William Hackett VC and Private Thomas Collins which was followed by the Last Post, two minute’s silence and the Reveille. The entire party then moved to the Memorial for the unveiling. 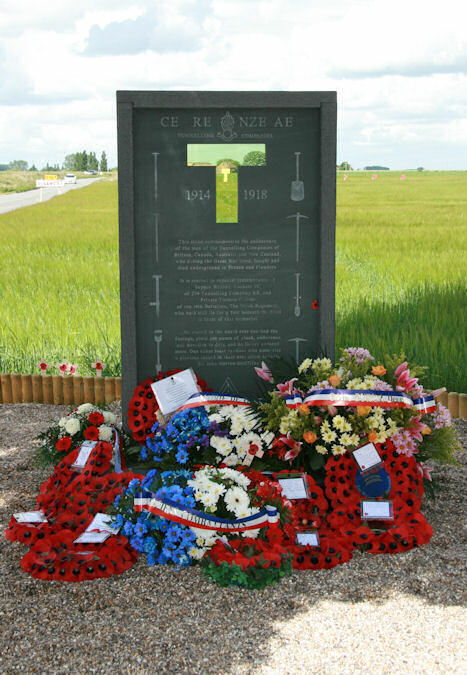 Firstly the Exhortation was delivered by WO1 Philip Moffitt RE and then the Tunnellers Memorial was unveiled by Monsieur Jacques Herbaut, Maire de Givenchy, and Monsieur René Cuvelier, Premier Adjoint au Maire. 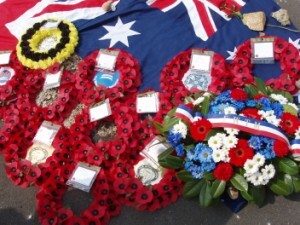 Wreaths and tributes were laid by officials. This was followed by the playing of the Marseillaise followed by the National Anthems of Great Britain, New Zealand, Canada and Australia (all countries who had specialist Tunnelling Companies). Finally there were wreaths and tributes laid by guests. There then followed a Vin ‘d’honneur in Givenchy’s Salle de Fete which included canapés and a couple of barrels of specially brewed “William Hackett Ale” (unfortunately run out by the time I made it to the hall). I think it is a very fitting memorial to that special breed of men who served and fought underground with such aplomb. The information panel designed so skilfully by OMB Direct is also a great addition to the memorial site. I can only echo countless other comments received on that day and thank Peter Barton and Maggie Lindsay Roxburgh for their vision, commitment and perseverance in erecting this long neglected memorial to the tunnellers. 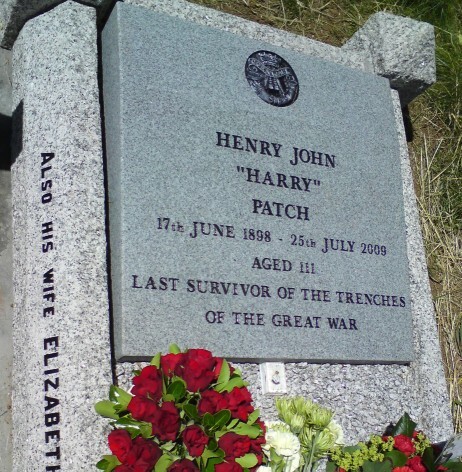 Had Harry Patch still been living he would have celebrated his 112th birthday today. It therefore seemed apt that a short service of dedication was held this morning at his new gravestone in the beautiful surroundings of the churchyard of the Church of St. Michael and All Angels at Monkton Combe. Along with about 20 others of friends and family I was delighted to attend and after the short service of dedication for the headstone presided over by Rev. Paul Langham we laid some flowers and chatted about our memories of Harry. He was such a part of our lives and it seemed strange in meeting up with his friends and family that he wasn’t there. Then again, as was noted by some, perhaps he was! The gravestone is simple – no doubt just how Harry would have wanted it. Apparently his grave receives a good number of visitors and I find it tremendous that his grave (and that of his parents) is now so well marked and looked after. Well done to the wonderful David Isaacs for organising this all so well. 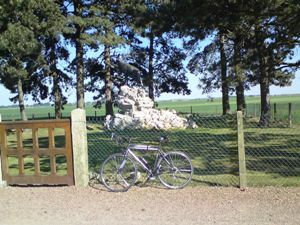 Whilst away for three weeks on the recent Somme archaeological dig I managed to get as many bike rides in as possible. I always try and take my road bike when I am in France for any length of time as it is such a great country to cycle in with the average Frenchman having a real respect for cyclists. Coupled with the huge open spaces, sparse population and traffic free roads, it is a cyclist paradise. On occasions I would squeeze in a quick 20 mile ride after a day on site – these rides were mainly a circle around the Peronne area. However, when time permitted I would drive up to the main British 1916 battlefield with the bike in the boot and set off from there. It would be a busy day if I saw a dozen cars per ride – the roads were delightfully quiet. But what has any of this to do with ‘News from the Front’? Well, for one thing, I would recommend cycling the area for all the reasons outlined above but also for a real appreciation of the lie of the land. 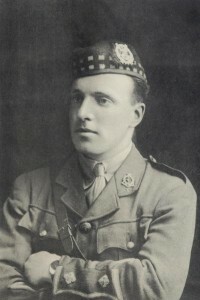 As much as I huffed and puffed up some inclines, my constant thought was that any difficulties I endured were nothing compared to those faced by the average British infantryman in 1916, weighed down with equipment on his back, rifle, grenades and faced with German artillery, MG and rifle fire. The relative slow speed of cycling enables one to spot features easily missed in a car and get a greater understanding of the battlefield. 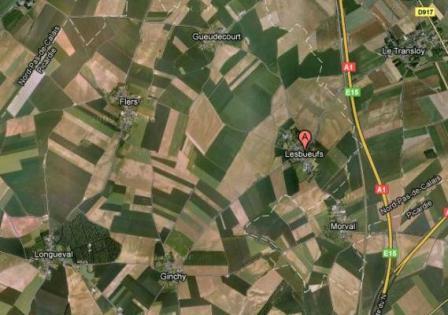 To illustrate this, whilst travelling between Ginchy and Morval I came across the following sign regarding ten new wind turbines or ‘aérogénérateurs’ in the area – a brief translation shows that they are planned for the Flers, Ginchy, Lesboeufs, Gueudecourt locality and the cut-off for public consultation is 14 June. These will cover much of the ground fought over in the Battle of Morval (25-28 September 1916). This area of the battlefield is rarely visited, especially compared to the 1 July line. I won’t comment on whether these ‘aérogénérateurs’are a good thing or not (the jury is still out on wind-power) but am pretty sure that they will get the go-ahead as there are so many of these in this part of France. They will alter the old battlefield but at least may focus some minds on this area. One can only hope that appropriate archaeological procedures are followed when the foundations are dug. I cannot imagine that earthworks on the scale required for these turbines will not disturb numerous Great War related features, perhaps also bodies of the fallen. Area of proposed wind turbines. Image courtesy of Google Maps. I received an email from a mate of mine a few weeks ago telling me that he was planning a visit to the battlefields in late-May. He was coming with a few friends for a boy’s weekend with a bit of remembrance and battlefield touring thrown in for good measure. It so happened that they would be in Arras on the day when I was planning to return to the UK after three and a half weeks on the Somme archaeological dig with Cream Productions. I couldn’t turn down a chance to give them a whistle-stop tour of the Arras battlefield and duly met them on the Saturday morning at Tilloy-lès-Mofflaines where I hopped in their car and gave them a running commentary around St.Laurent Blangy, Athies, Point du Jour, Fampoux, Roeux and the site of the infamous Chemical Works, Monchy-le-Preux and a walk up Infantry Hill, with a run back down the Arras-Cambrai road past Feuchy Chapel back to my car. Whilst at Point du Jour we visited the graves of many of the Grimsby Chums (10th Lincolns) whose bodies were found in 2001 when foundations were being dug for a nearby BMW car factory. 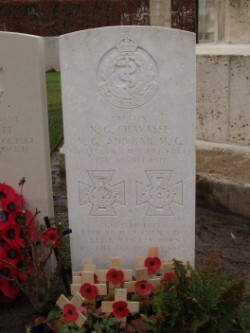 These bodies were buried with full military honours in the nearby cemetery in 2002. Sadly, positive identification of any of the remains proved impossible and all are now buried in graves marked with ‘unknown’ headstones. One unexpected outcome of the whistle-stop tour was an answer I received to my usual question of ‘Did you have any relatives that fought in the war?’ One of the party, Rob, responded by telling me he was related to the Great War fighter ace, Albert Ball VC, DSO & Two Bars, MC. He had read about Ball’s exploits recently and this had stirred his interest in the visit. I was glad to hear that next day they all visited Ball’s grave in Annoeullin Communal Cemetery, German Extension. So, whilst a lightning quick overview of a very small area, it was still a great way to spend a morning. 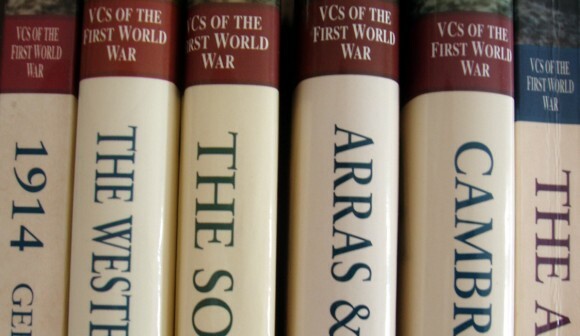 It was also the first time that I had used the new Arras panorama volume on the battlefield – an mighty useful it was too! Many thanks to Rob, Chilts, Errol and of course, Pieman and his massive but silent car. Along with Peter Barton, Tony Pollard & Iain Banks (GUARD) & Gary Andrews I again attended the Aubers Ridge 9 May commemorations at the Australian Memorial Park at Fromelles. The battle in May 1915 (ninety-five years to the day) was an unmitigated disaster for the British Army – losses were particularly heavy in the 8th Division. I went last year for the first service of commemoration and was delighted to see that the turnout was similar. 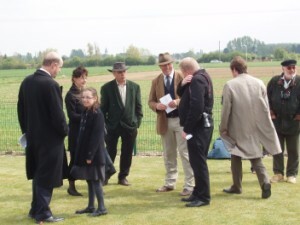 It was organised by the wonderful Victoria Burbidge who does so much to ensure that British endeavours over that blood-soaked piece of land are remembered with the same vigour as are the actions of their Australian counterparts a year later. The service was simple but dignified and I would commend it to anyone as a very good example of heartfelt remembrance. 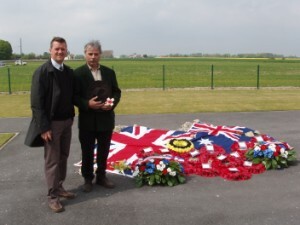 I was honoured to lay a wreath on behalf of the ‘Breathing Fire’ documentary crew. It was good to see a few friends there, especially Johan Vandewalle who had driven down from Polygon Wood. We had to miss the reception afterwards as had meetings lined up in Peronne but I congratulate all who worked so tirelessly to make this event such a success. Some pictures of the day are attached. Chatting after the ceremony. Victoria Burbidge speaking with some of those who attended. I spent last weekend (16-18 April) taking a family from Bristol on a battlefield tour to Ypres. It had been a while since I have been there after so much recent research effort on Arras for the forthcoming book and the Somme for next month’s TV documentary (of which more details to be released later). The family wanted to follow in the footsteps of their grandfather and great-grandfather who both served during Third Ypres as well as see the usual sites. This meant a fair bit of in-depth research on two actions that I hadn’t studied before – I’ve passed over the ground en route to somewhere else but never actually looked into what happened at each spot. I was in the extreme north of the advance, up at Faidherbe Crossroads – les 5 Chemins area (at a place called Madonna) in front of Houthulst Forest to cover the 35th Division attack on 22 October 1917. I then moved down to more familiar territory and focussed on the 9 October 1917 attack of the 2nd Royal Warwicks against Judge Copse. Lunch was taken at my good mate Johan Vandewalle’s café, De Dreve at Polygon Wood (www.polygonwood.com). I also took them to Harry Patch’s memorial to the 7th DCLI in front of Langemark, Vancouver Corner for the Canadian Gas Memorial, Tyne Cot Cemetery (where I bumped into my brother as he was guiding for a trip! ), Black Watch Corner down to Clement Robertson VC’s bridge as well as a good cup of tea at the Hill 60 café and then a good stroll around the hill and a stop at the Caterpillar crater. Sunday morning was spent with a quick stop at Brandhoek New Military Cemetery to visit the grave of Captain Noel Godfrey Chavasse VC & Bar, MC. We then drove down to the Messines battlefield to view the mine craters of the Messines attack. The group were mightily impressed by the sheer size of Peckham Crater and Spanbroekmolen. We then headed south to Ploegsteert (Plugstreet) for the Memorial to the Missing where I told them all about Sapper William Hackett VC, 254 Tunnelling Company, Royal Engineers (see www.tunnellersmemorial.com) and then turned about-face and arrived at our final stop – Talbot House, Poperinghe. The tunnel back was much busier than usual owing to the closure of airports but, despite missing our chosen train, I arrived back in Bristol at about 8.30pm. A tiring but brilliant trip all carried out in most un-Flanders like glorious sunshine! My thanks to Robert, Helen, David, Robin, Nicky and of course Thomas for being such charming travel companions.